One thing we always hear about our tea rooms and see written by customers online is that stepping into any of our Tea Terrace branches is like stepping into a world of Alice in Wonderland! When we first started thinking of the interior design, we wanted a luxurious style that reflected the opulence of the Victorian royal palaces where the tradition of Afternoon Tea was born. Lady Anna Maria Russell, Duchess of Bedford, is credited with the creation of the meal circa 1800. The Duchess was a lifelong friend of Queen Victoria, whom she served as a Lady of the Bedchamber between 1837 and 1841. The Duchess thought of the idea of Afternoon Tea to ward off hunger between luncheon and dinner, which was served later and later. The tradition continues to this day. Up until the mid-1940's, there used to be an abundance of tea rooms in the UK which provided the popular fare of cream and jam on scones with tea, a combination commonly known as “cream tea”. But these declined in popularity after World War II. Our decor is quasi-modern with traditional Victorian touches such as our very popular and regal "throne chairs" and ornate sofas. The over-sized and high-back throne chairs is probably the reason that many of our customers feel The Tea Terrace has an Alice in Wonderland feel to it. That couple with the colour scheme which is based on white, pastel blue and pastel pink. Why these colours you may ask? 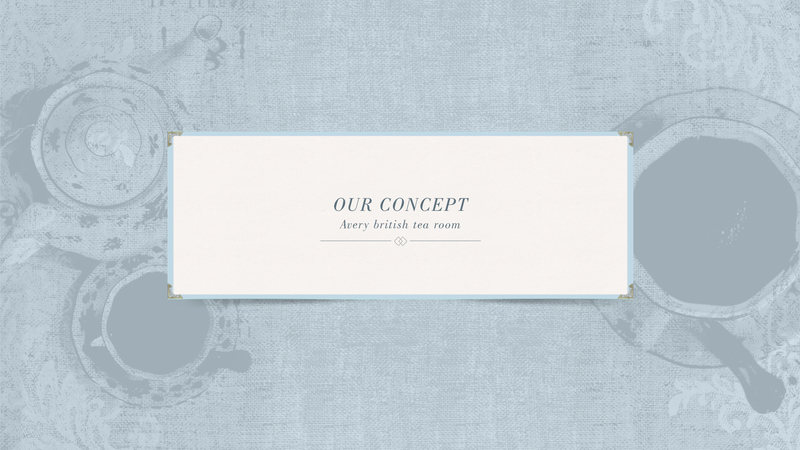 Because our founders wanted a chic and elegant colour scheme which was feminine and regal at the same time. Pink best symbolises femininity and blue is considered the color of royalty. But we went with a pastel blue with best worked with the white and the pastel pink. For our china, ie. 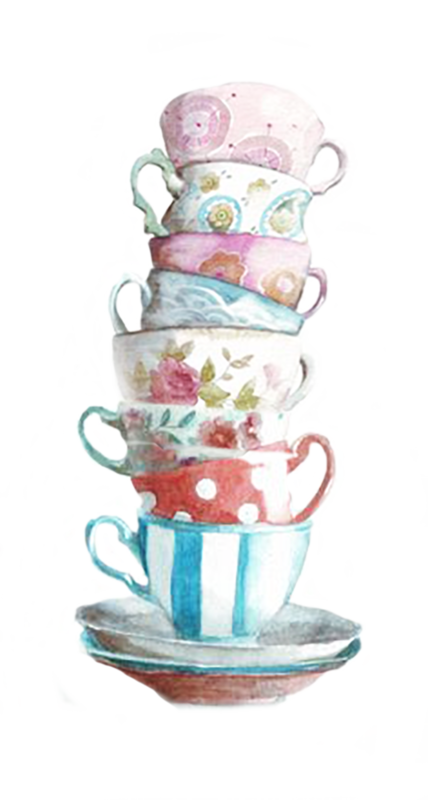 the plates, tea cups, saucers, teapots, coffee mugs, and espresso cups etc, we use a very luxurious English brand of fine bone china with a long history dating back to 1896: Royal Albert. This premium brand was created when Thomas Wild Senior and Son Thomas C Wild bought the Albert Work In Longton Stoke on Trent. Built in 1846, the Albert Works had been named after Prince Albert, Queen Victoria's Consort. Thomas Wild produced a range of Commemorative Pieces for Queen Victoria's Diamond Jubilee, which led to the Queen awarding the company with a Royal Warrant. In 1904, as a result of the Royal Warrant and the company's many links to the Royal Household, Thomas Wild took the name Royal Albert for his company. 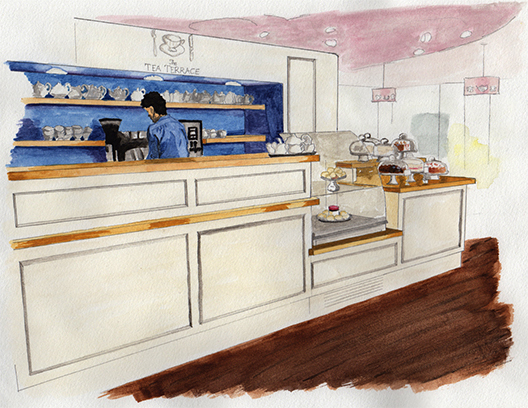 While The Tea Terrace is designed primarily as a tea room, we intended it to be a fully-fledged restaurant as well. 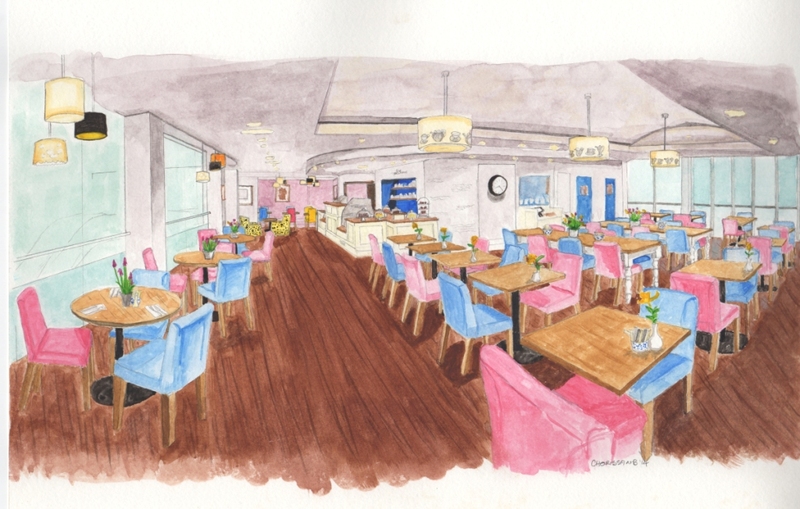 We wanted people to be able to enjoy not just cakes, scones, afternoon and drinks, but also to indulge in some traditional British breakfast and lunch dishes as well. So our menu has an extensive range of breakfast items as well as lunch items starting with soups and salads all the way to jacket potatoes, steaks, burgers, traditional pies (such as cottage pie and chicken pies) and light dishes such as Welsh Rarebit. Our menu has evolved and grown over the past years since we opened our first branch in 2010. Customers today are always shocked at the number of options available to them in our menu. We wanted a menu that caters to every taste and every dietary requirement. That's why we have a dedicated gluten-free menu offering a wide range of dishes to customers who are allergic to wheat. We also have a lot of vegetarian and some vegan options. Perhaps what we are most famous for are our delicious scones, cakes and afternoon teas. Many of our customers have described our scones as the best in the country, even better than those found at 5-star hotels in London and around the world. Our scones are always served warm with Cornish clotted cream and strawberry jam. They are crunchy on the outside and light and fluffy on the inside and always fresh. We have the largest variety of flavors of scones in the country, from plain and fruit scones to Ginger and Cranberry & White Chocolate Scones. Our cakes are also considered the best cakes around and are always served fresh with more than 10 flavors to choose from including the very popular and very English Victoria Sponge as well as gluten free options like lemon & almond and orange & lavender (which is also dairy free). And last but not least there is the drink around which we built The Tea Terrace brand: tea. We use only whole leaf premium teas of the highest quality. We don’t believe in serving supermarket-brand teas. The difference is that our gourmet tea is made up of whole, unbroken leaves. Whereas supermarket brand teas, even some of the expensive ones, are usually made from the opposite – low tea grades, such as dust and fanning. This means that the tea loses many of its essential oils (what makes tea flavorful & aromatic). This results in a drink that is both dull and stale. Many of our customers cannot go back to their old brand of tea once they have tried our delicious teas, and that's why we sell packets of our tea. We also offer a wide range of other hot drinks such as coffees and chocolate drinks, as well as many cold drinks including fresh juices, iced teas, smoothies, milk shakes, sparkling drinks, beers and wines. We believe that delivering a very high standard of customer service is even more important than the great interior design and the superior quality of food and drink. We understand that our customers come to our unique tea room for the full experience based on the above three.pillars of our brand. Breakfast, lunch or afternoon tea at The Tea Terrace is a trip for the senses. Customers need to be transported to a time when guests at a royal household were ladies and gentlemen being served by ladies and gentlemen. That means we train our staff to treat every customer as a VIP. Our customer-facing staff are carefully selected from hundreds of applicants to ensure they have the right attitude so that they are able to deliver our exacting customer service standards. Since opening our first branch in 2010 we have had more than 20,000 job applications for various positions at our tea rooms. We want every customer not just to feel valued, but also to have a lovely and memorable experience at our tea rooms. We are always very proud when we see our customers sharing their happy moments at The Tea Terrace with their friends and family by posting their Tea Terrace photos on Facebook, Twitter, Instagram and SnapChat as well as other social media. Just search for the hashtag #teaterrace or #theteaterrace on Instagram, for instance, and you will see thousands of photos of our customers having a great time and making fantastic memories at our tea rooms. We want every visit you make to The Tea Terrace to be an escape to an enchanting and relaxing experience.